Today's digitally globalized and interconnected insurance industry is capable of delivering faster and easier claims processing and management alongside more responsive customer engagement and additional operating efficiencies. The rising population, new businesses, and governmental infrastructure investment are all stimulating insurance industry growth which in turn is creating a greater need for insurance claims processing and management solutions. Solution providers are harnessing next-generation technology, structured approaches, and their skills and experience to better enable insurers to respond to rapidly-evolving claim situations across the claims process life cycle. 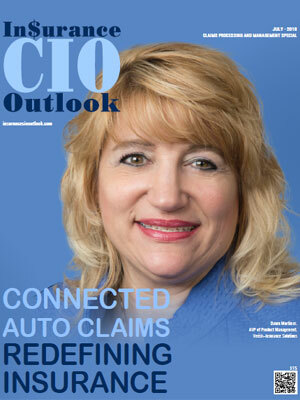 The application of IoT, wearable devices, drones, auto appraisals, customer video chats, and bots in the industry is helping understand the dynamics of the market, providing real-time insight into risks and imminent trends to maneuver and manage claims situations. Advanced analytics, data mining, rule-based engines, social network behavior analysis, and robust fraud detection components address each aspect of large, complex, and rapidly evolving claims cases. Providers are also collaborating with specialists in related disciplines such as insurance and tax, and industry-specific expertise in manufacturing, pharmaceutical, financial, and governmental services to enhance their claims solutions. 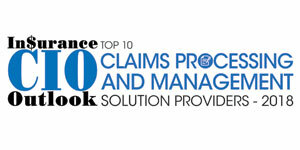 A distinguished selection panel comprising CEOs, CIOs, VCs, and the magazine's editorial board has selected a list of the top companies offering claims processing and management solutions. 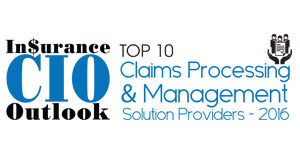 These companies leverage innovative technologies and strategies to enhance carriers' ability to keep pace with the speed of innovation in claims technology, smooth out fluctuations in claims volume, and respond to the legal and regulatory requirements associated with large-scale claim cases. 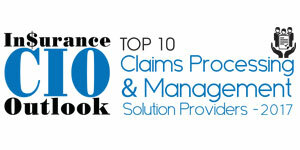 We present to you Insurance CIO Outlook’s "Top 10 Claims Processing and Management Solution Providers – 2018."